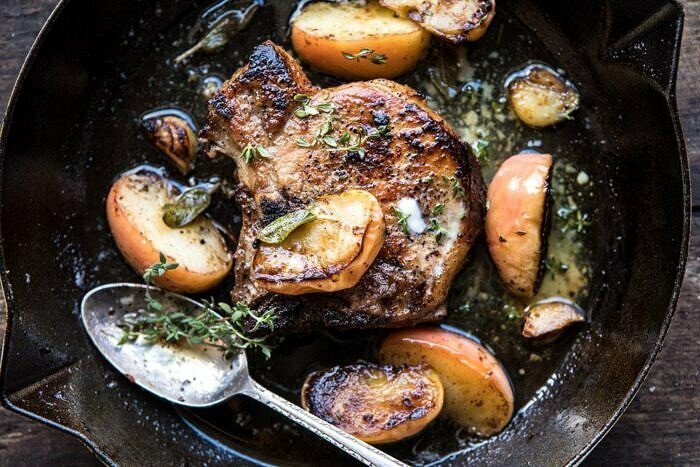 Apple Butter and Sage Pork Chops. 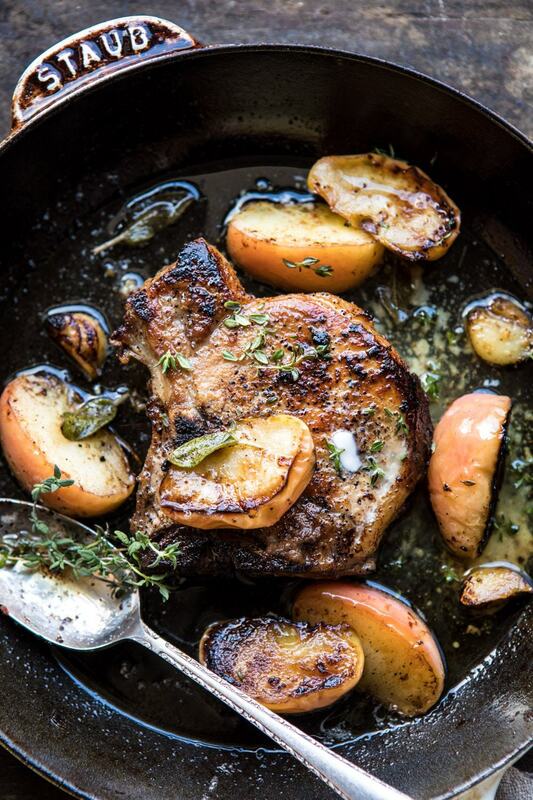 Simplifying dinner tonight with these Apple Butter and Sage Pork Chops. This easy recipe is all things fall. Pan seared pork chops with apple butter, sage, a splash of balsamic, and a little browned butter…for good measure. It doesn’t get simpler, cozier, or more delicious than this pork chop recipe. 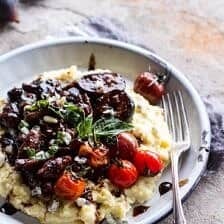 Great any night of the week with a side of creamy polenta and a colorful salad. 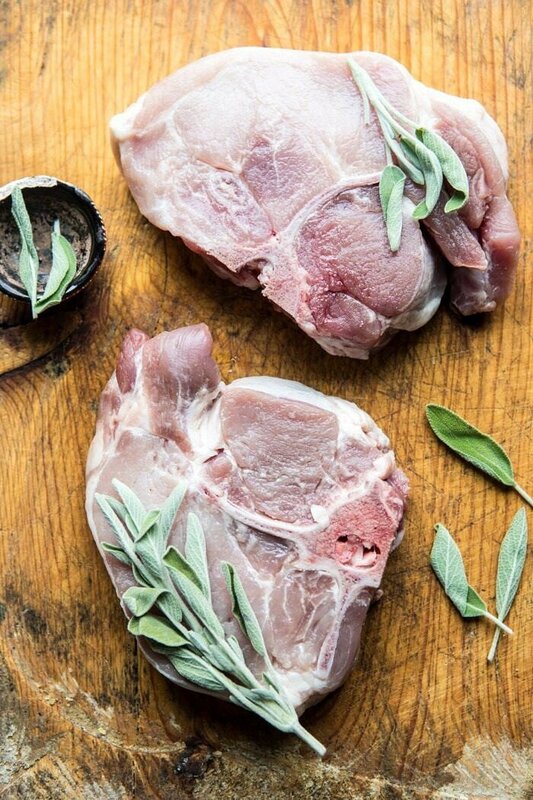 Did you grow up eating pork chops? I did not, and for the longest time cooking with pork chops has never excited me. But within the last two years or so I’ve really grown to like them. I don’t make them often, maybe once every few months, but when I do make them, I always ask myself why I don’t cook with pork chops more. Sometimes I get so stuck in my chicken dinner routine that I forget to incorporate other forms of protein. Anyone else do the same? Today it’s time to break out of the chicken rut and embrace a dinner that’s just a little different (at least for me). A few years ago when I was testing recipes for the HBH cookbook, I started to play around with pork chops. 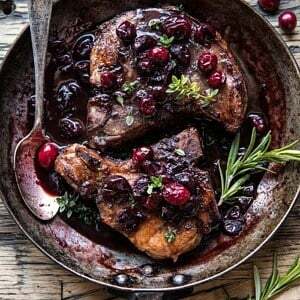 In the end I developed one of my favorite recipes in the book, the balsamic fig roasted pork chops. It’s sweet, savory, and a great way to incorporate figs into dinner. It’s also so easy. This recipe today is inspired by the pork chops in the cookbook. Fig season is so short, and I always have the hardest time finding fresh figs up here in the mountains. So I wanted to create an autumn inspired pork chop recipe for when I can’t find fresh figs at the store. Enter these apple butter and sage pork chops. Very different from the recipe in the cookbook, but just as delicious. Side Note: It’s been so chaotic lately that I’m just now realizing that we passed the cookbook’s one year anniversary this month! It’s so crazy that the book has been out for an entire year now. What’s even crazier? To this very day I am still getting messages, photos, and comments through email, the blog, and Instagram about the cookbook. It’s the BEST thing in the world, and I just have to say THANK YOU to you guys. I love seeing all the recipes you have made. It’s fills me with so much happiness knowing that you guys are still, even a year later, enjoying the HBH cookbook. Thank you. THANK YOU! Just like chicken, pork chops are incredibly quick cooking. This recipe takes thirty minutes tops and uses under ten ingredients, Honestly, I didn’t know I could create a recipe with an ingredient list so short. But hey, I did, and hey, I kind of love it. Start with a heavy cast iron skillet (this is my current favorite Staub skillet) and get it screaming hot. Pan sear the pork chops to give them a nice crust, then lower the heat to slowly cook them though. Once they are cooked, remove the chops from the skillet and rub them with a thin layer of apple butter. Yes, I am apple butter obsessed right now. Really hoping you guys do not mind. In my defense, it’s truly just the most addicting spread that can be used in both sweet and savory recipes. Hands down my favorite ingredient right now. 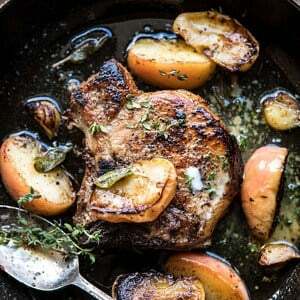 To the same skillet, sear the pork chops, add some butter, and cook the garlic, sage and apples for a few minutes to give them a head start on cooking before heading to the oven. Add the chops back to the skillet and drizzle with a little balsamic vinegar for a nice tang. Then transfer everything to the oven, and broil until the apples have a nice char on the edges. Personally, I really love serving these pork chops alongside some creamy polenta (with cheddar cheese swirled throughout). But wild rice and quinoa would be equally great options. And then a nice salad to round out the meal. If you make these apple butter and sage pork chops, please be sure to leave a comment and/or give this recipe a rating! Above all, I love to hear from you guys and always do my best to respond to each and every comment. And of course, if you do make this recipe, don’t forget to also tag me on Instagram! Looking through the photos of recipes you all have made is my favorite! This easy recipe is all things fall. Pan seared pork chops with apple butter, sage, a splash of balsamic, and a little browned butter. It doesn't get simpler, cozier, or more delicious than this pork chop recipe. Great any night of the week with a side of creamy polenta and a colorful salad. 2. Heat a large skillet over medium high heat. Season the pork chops all over with kosher salt and pepper. Add the olive oil to the skillet, when the oil shimmers, add the pork and sear on both sides for 2-3 minutes. Reduce the heat to medium and continue cooking for about 5 minutes, or until the pork chops are cooked through. 3. Remove the pork from the pan to a plate. Spread each pork chop with a layer of apple butter. 4. To the skillet, add the butter, garlic, apples, and sage. Cook 1-2 minutes then remove from the heat. Slide the pork back into the the skillet. Drizzle the balsamic vinegar over the pork. Transfer the skillet to the oven and broil for 2-3 minutes or until the apples are lightly charred. 4. Remove from the oven and top with fresh thyme. Spoon the butter over the pork chops. Serve and enjoy! 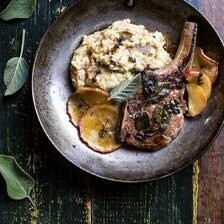 Cider Apple and Sage Roasted Pork Chops with Brown Butter Gorgonzola Polenta. 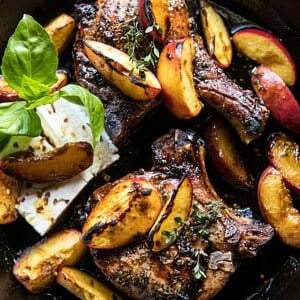 Skillet Balsamic Peach Pork Chops with Feta and Basil. This really is all things Fall!! Lovely recipe! Any suggestions for having the pork tender? Oh my!! This looks sooo good!! Great recipe. Thank you Patti! This is so sweet! I’d be careful not to overcook the chops. 3-4 minutes sear, 8-10 minutes low heat but then back under the broiler for 4-5 minutes – that’s 15 to 19 minutes total. New guidelines for pork are cook to 145 degrees – don’t go by time, go with an instant read thermometer. An over cooked pork chop is a ruined pork chop. Also, start with chops at room temp. If you ever get your hands on Iberico pork or see it on a restaurant menu, you must try it. It’s wonderful. I will be sure to! Thank you Dana! If we don’t have time to make the apple butter can you suggest a substitute for it? This looks AMAZING can’t wait to try it! And I feel you, I often get stuck in a routine too but with tuna! Tuna sushi bowls, tuna tostadas and seared tuna! It’s nice to be reminded that other proteins can be simple to cook too! I hope you love it Dan! Its really easy and hard to get creative sometimes! Glad i’m not alone haha! The chicken rut is an easy one to get in! It seasons well and goes with anything. Love the subtle hints LOL. Its so nice to hear my recipes are your go to (: Thanks so much Joanna. Hopefully the next book will be just as good! I literally just made apple butter today; this is perfect 🙂 Looks so delicious! Apple butter is the best!! I hope it was delicious. Thank you Brittany! So glad you liked it Joyce! Thank you! Made this tonight. I skipped the cook pork 5 min at med. they don’t need it. They finish in the oven at the end and continue cooking off the pan when done. Delicious. Sounds like a good way to do it!! So happy it was good! Thanks! Love this Fall take, can’t wait to make this for my fam! Pinned! YAY, Hope you guys love it. Thank you Jess. Oh my gosh this was so, so good. I had a majority of the ingredients so decided to make this recipe the day you posted it. This was so easy, and the pork was perfectly tender. I made two pork chops (assuming I would have one the next day) and I ate both pork chops in one sitting. I then made this again a day later lol. May or may not have ate both pork chops again. Thanks so much! Going to try the pork chops in your cook book next. I am so glad you loved this and hope you love the ones in the book just as much! Thank you Bridget! Delicious pork recipe. Had fun making it. I don’t do Social media, how can I send you a picture of the finished product? Hi Scot! I am so glad you loved this! You can email me at contact@halfbakedharvest.com or you can change the photo into a url and post it in the comments! I cannot wait to see it! 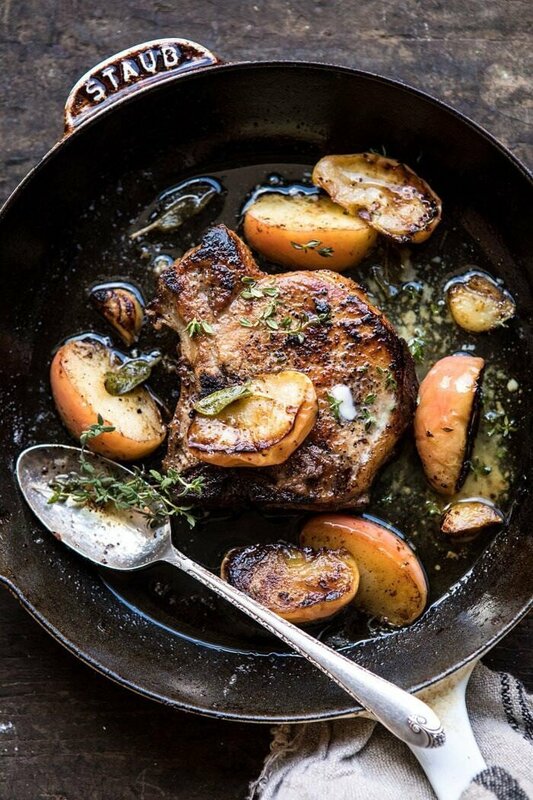 Pork chops with apple butter and sage -amazing! Thai chicken and peanut butter Raman – had to make it again , everyone ate it up in a heartbeat! Thank you for your amazing recipes. I love the cookbook as well. It made a great Christmas present for my sisters and children. They have heard me rave and loved the recipes I’ve cooked for them and now they all love the cookbook! I would love to see your next cookbook w all one pan dishes ! I love those! Oh and I also made the bursting blueberry cake w cardomom ! Wow I cooked a lot this week! Thank you so much Lindsay! I am so glad you loved all of these recipes! Also, one pan dishes are the best and that is such a great idea!! OH MY GAWD. Made this tonight, and it was INSANELY good. I substituted pears for the apples (we have a pear tree!) and I’m not joking, my husband was literally licking his plate. Another big hit from HBH!! That is so amazing! I am so glad you and your husband loved this recipe and I bet it was so great with your own pears! Thank you! Hi Tieghan! My husband and I just finished these pork chops, which I made for the first time. They were absolutely delicious and so flavorful! A perfect fall dish. However, they were a little salty for our taste. Is it possible to use unsalted butter instead, or to keep the salted butter but not season the chops with it? Just a little less salt would make this dish perfect for us. Thanks so much, and Happy Fall! Hi Jen! I am so sorry about that, but I am so glad you still liked this! I would suggest going lighter on the kosher salt. If it is still too salty please let me know! Thank you! This recipe is so delicious! Made it tonight and it was perfect for a chilly fall evening! Made it exactly like the recipe says and it turned out perfectly. I’m not usually a big pork chop fan, but I will be making this again very soon! Thanks Tieghan! I love these flavors, what a delicious fall dinner idea! I LOVED this dish! It was easy to make and the flavor was super delicious. I’ll be adding this to my fall line up! Thank you Sarah! I am so glad you loved this! I made this yesterday for my boyfriend and a friend and all three of us absolutely loved it! 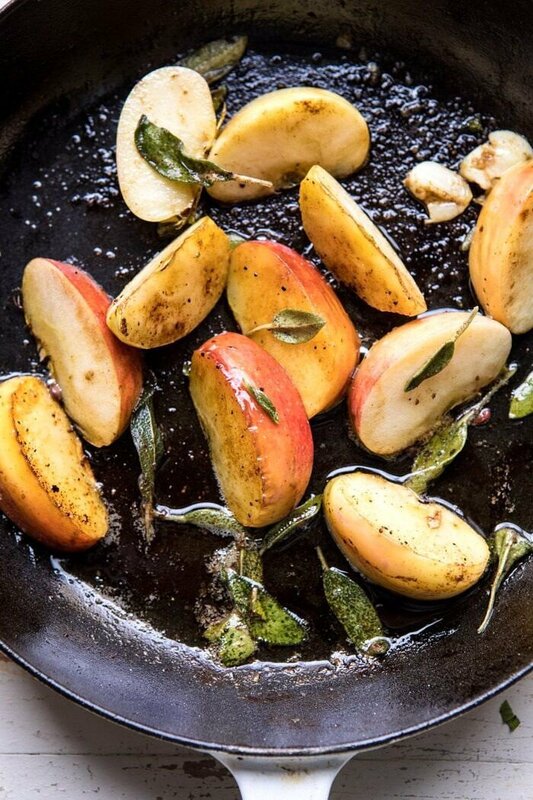 Thank you for this beautiful recipe, the flavors of the sage, apple and thyme are delicious. I made brown rice and a purple lettuce salad with ricotta and walnuts on the side, it worked really well together. Thank you so much Sophie! I am so glad you loved this recipe and I hope you continue to love others on my site! Have been reading your website for a long time, first comment though 🙂 Your recipes, your photos, everything is amazing. I made the apple butter a while ago, loved it, passed the recipe to my Mom in Ukraine, she made two batches already and the family loves it, thank you! Last night I made the pork chops with apple butter and I was told “The best pork chop I’ve ever tasted!” Thank you for making me look like a pro. Sending you lots of hugs and thanks from NY. Keep being awesome! Wow that is so amazing! I am so glad you have been loving my recipes and your family has as well! Thank you so much Lena! Made this tonight and it was INCREDIBLE! Another winner! This was easy to make and delicious. Every Friday night I cook for my husband’s single guy friends, and this is the 4th recipe that I’ve cooked for them. They absolutely loved it. I overheard one of them say that they feel like a king eating this food…haha. Thanks for another wonderful meal. Thank you! I am so glad you loved this Kristen! This is so good, my super picky husband loved it.